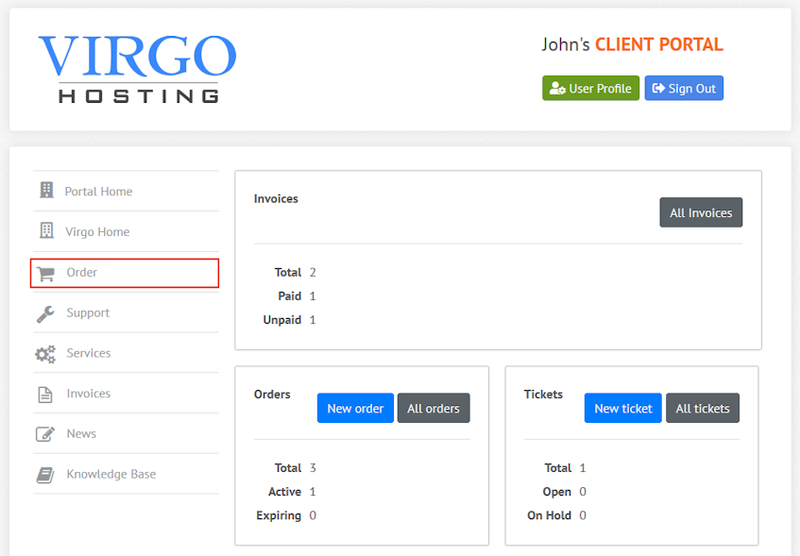 You can order services inside Virgo Hosting Client Portal easily with the help of our user-friendly ordering interface. Select the service you'd like to order by clicking the service's name in the "Select Service" interface. Configure your selected service in the "Service Configuration" interface and click "Order" button. If you have a coupon code, click "Have coupon code?" link and click "Apply" button after entering the coupon code. Select "CoinPayments" if you'd like to pay with cryptocurrencies. When you click "Checkout" button, you will be redirected to the payment interface in CoinPayments website for payment. Select "2CheckOut" if you'd like to pay with with your credit card. When you click "Checkout" button, you will be redirected to the payment interface in 2CheckOut website for payment.